This easy recipe starts with a box of macaroni and cheese and becomes a main dish casserole with the addition of diced cooked chicken and frozen-thawed vegetables. 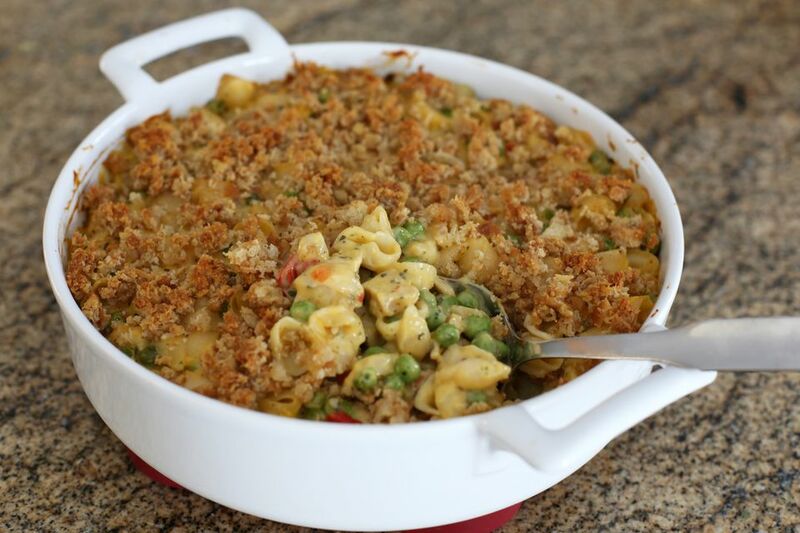 The casserole is topped with buttery breadcrumbs and then is baked to homemade perfection. Sprinkling on some shredded Cheddar cheese before the breadcrumb topping adds a bit more flavor and texture but is not necessary. This is a quick and easy meal to prepare with convenience foods, but if you are not a fan of condensed soup, replace it with about 1 to 1 1/2 cups of white sauce or a seasoned bechamel sauce made with part chicken broth. Use leftover cooked chicken or a rotisserie chicken in the dish, and whatever frozen vegetables your family likes. You can also use a package of the deluxe-style macaroni and cheese in place of the regular. Lightly butter a 2- to 2 1/2-quart baking dish or spray it with nonstick cooking spray. Cook the shells as directed on the package. Drain, return to the saucepan or a large bowl and add the cheese mixture, cream of chicken soup, and the diced chicken. Meanwhile, heat the olive oil in a skillet or saute pan. Add the onion and celery and cook, stirring, until the vegetables are tender. Add the thawed vegetables and red pepper or pimiento to the skillet and cook, stirring, for 2 minutes longer. Combine the sauteed vegetables with the pasta and chicken mixture; taste and add salt and freshly ground black pepper as needed. Spoon the pasta mixture into the prepared baking dish. Top with shredded cheese, if using, and the buttered breadcrumbs. Bake for 30 to 40 minutes, until the breadcrumbs are lightly browned and the casserole is bubbling around the edges. Serve this easy all-in-one dish with a simple tossed salad or sliced fresh tomatoes, along with hot biscuits.